But no, I had to find out for myself. I tested the script by printing, the script ran and moved the document from one queue to another. An error message appeared in the queue, the print showed as 1 page, it stuck at rendering about 550kb out of 1.5mb, then nothing. I cleared the error and kept working on the script. What I didn’t know was that on the copier the print was sent to it churned out 1000 pages of print error – those irritating one line, ‘gobbledygook’ characters of text. Someone happened upon the copier, laboring under my insanity for infinity, and turned it off. No one reported it – which is typical. Another day in printer hell. So, I was on my usual horse today. I wasn’t dreading it as much as I thought I was and the lesson went okay after a shaky start. 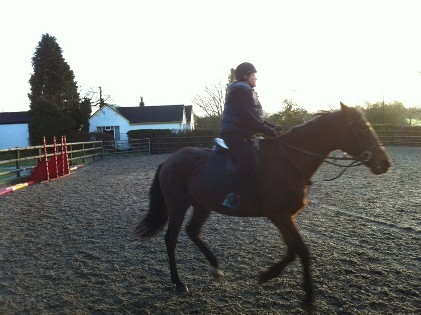 It was 9am – first lesson of the day, first lesson for the horse as well and she takes a bit to get going. I felt better cantering today on her than I have over the past couple of months. My brain shut down in September and I had a really difficult time with even cantering in a controlled way. It felt so dispiriting because back in July I started to jump and did it at a canter so to lose all of that progress killed me. Keeping my heels down is what I need to really work on. I did do my pilates exercise for riding when I came home to stretch my legs. I know I need to work on lengthening my calf/thigh muscles so my weight falls into my heels better. This coming Sunday’s Homeland episode is titled Gerontion. What does that mean, I wondered and discovered it is a T S Eliot poem with a ton of meaning about aging, historical truths and how that alters/changes, religious symbolism etc etc. The best blog on explaining it that I found was this. Wikipedia has other stuff but not as in depth or interesting. The wiki reference to the line ‘wilderness of mirrors’ has apparently been adopted by the spy trope so I’m guessing the Homeland episode relates to Saul and how he is feeling the changes in the CIA, his age and place in that ever changing structure. Sounds interesting – I can’t wait to see it. We’re reading Candide by Voltaire on our Literature course. The philosophy it deals with – be happy because things are as they should be in the world – has made me think. Voltaire talks about – well, what is a world – my world, your world, the world – are different places considered different worlds. I also think the play on names is interesting – like Candide – which means white – or blank page and Candide’s philosophy teacher was called Pangloss which is a combination of Greek words – Pan (all) Gloss (tongue) – all tongue – all talk. As I worked through computer problems today – all laptops had to be reconnected to the new wifi / the software company trying to remote install software on a server kept receiving an error they told me to get sorted before they could proceed. So, was it all meant to be? Was it all as it should be? All through the issues I kept thinking back to Candide and wondering – is it worth getting upset about just because this is how the cards fell today? Yesterday everything worked – today, it didn’t. There is a bit of ‘que sera sera’ about it all but I like how I thought about the book rather than getting upset about things not going to plan. We’ll see how long that accepting attitude lasts! Went back to work today after a week off. I love days when a lot of bulk gets done. We sorted out the music PCs – after 3 long weeks of rebuilding, testing software, failing, trying again. Then, finally, success! They are all hooked up to the Yamaha midi keyboards and they all work. Trial wifi was put into a couple of rooms and I’m excited to see how that pans out with multiple user logons happening all at once. And we sorted out a giant mess of cables in our bugbear IT room – all cables off the floor and hidden underneath the tables in trays. I’m hoping we’ve turned the corner with all the niggles and troubles that have been plaguing us for the past 8 weeks. It’s been nearly a year since we received the funding for the IT upgrade project so to have come this far in a year should be celebrated. I want time to appreciate the grind of the past year.